on Shopping campaigns, our new campaign type for Product Listing Ads (PLAs), and that the regular PLA campaign type will retire in late August 2014. To upgrade to Shopping campaigns, we encourage you to create a Shopping campaign from scratch and then customize your product groups and bids from there. That way, you can choose how granular you’d like to get and ensure all your inventory is included in your Shopping campaign. However, if you would like to base your Shopping campaign on a regular PLA campaign, we’re introducing an option today to help you upgrade. After setting up your Shopping campaign, you’ll be taken to a new page to create ad groups. Here, you’ll see two options: the ability to start fresh with one ad group or create one or many ad groups based on a regular PLA campaign. 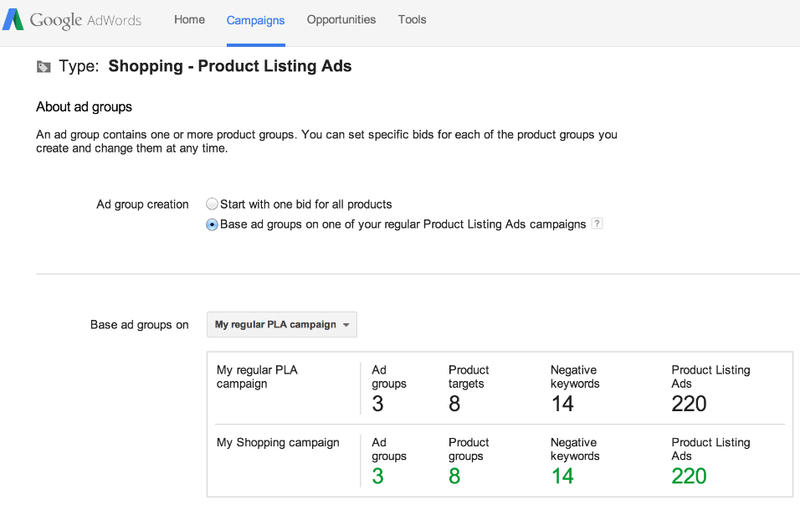 Note that some parts of a regular PLA campaigns aren’t transferable to a Shopping campaign, like product targets that use AdWords labels or groupings. If none of your PLA campaigns are transferrable, you might not see this option. With Shopping campaigns, you no longer need to create separate ad groups or product targets to track your impressions, clicks and cost. You can analyze and report on your PLA performance by product attribute or by individual items in the Dimensions tab, regardless of your campaign structure. As a reminder, all PLA advertisers will need to upgrade to Shopping campaigns by late August 2014, at which time all remaining regular PLA campaigns will be automatically upgraded. Over the next few months, we’ll continue to share more information and tools to help you upgrade your campaigns and manage them at scale. Earlier this month, we shared a few success stories on Shopping campaigns, our new campaign type for Product Listing Ads (PLAs), and that the regular PLA campaign type will retire in late August 2014.